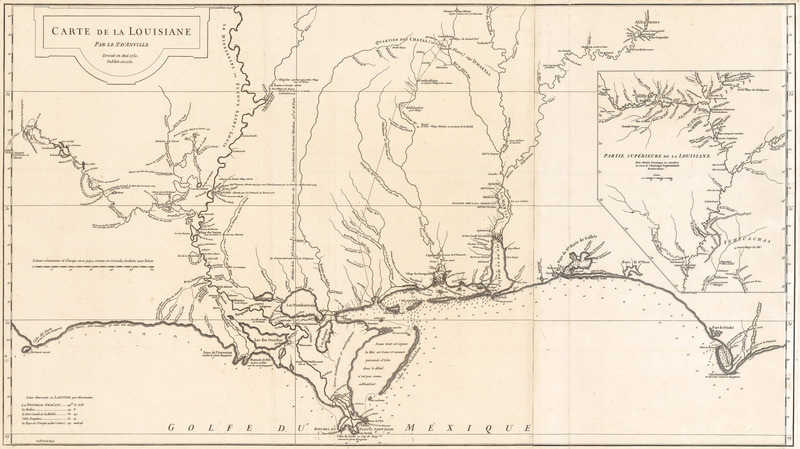 This is an authentic antique map of the gulf coast and Mississippi River Valley during French and Spanish occupation. The map was published by Jean Baptiste d’Anville out of Paris in 1752. This extraordinary map is one of the more desirable large format maps of the gulf coast from its time. The map extends from Cabo del Norte (present day Louisiana / Texas border) east to Cabo Escondido (near present day Tallahassee, Florida). The Mississippi River Delta, Mobile Bay, and Pensacola Bay are shown with great detail that includes villages, forts, rivers, and varying water depths. A large insert shows the extent of the Mississippi River Valley as far north as present day Wisconsin and west to Kansas. Much of the coastal cartography was derived from earlier manuscript work compiled by the French Engineer Valentin Devin. The interior detail comes from another French Engineer Ifnace Broutin. While the map lacks topographic detail, it excels in providing early information with regard to the Gulf Coast, Mississippi River and their vast tributary systems. Much of the information used to produce this map was compiled from 1720 to 1732. D’Anville was regarded as one of the most respected French cartographers from the mid-18th century, until his death in 1782. Most known for his atlases and large format maps such as this, d’Anville’s works were sought after by numerous historical figures. Thomas Jefferson collected a number of d’Anville’s maps, including this one and Meriwether Lewis obtained a copy prior to the Lewis & Clark Expedition. Condition: Map is in A condition showing a strong impression on thick, clean paper.